Mousse cake recipe is quite simple and requires no special skills, but the assembly, perhaps, need to pay a little more attention, the process is still tedious, but again - nothing fancy. In general, if you prefer unusual cakes, light as a cloud, texture and appreciate the combination of gentle cream and fresh fruit notes of sour, the mousse cake recipe you will definitely come in handy! Universal vanilla biscuit deserves special attention: for all the simplicity of preparation (there are no separately whipped 6 proteins :) it turns out always lush, high and very fragrant. For the same recipe, you can safely prepare cupcakes and "quick" pies with fruit or berries. Smell - creamy-vanilla crazy! And if you are not too lazy and wrap the cooled biscuit in a film, send it to the refrigerator for the night (so that all moisture remains inside, and the taste becomes even more saturated), you will get just a chic result. By the way, in a film or in a container, such a biscuit can be stored in a cold place up to 5 days easily. vanilla extract/ Vanilla - to taste. syrup / juice from the fruit used in jams* (To soak the gelatin) - 40-50 ml. *A syrup or juice we use to make fruit mousse light shade; It can also be used, and water. 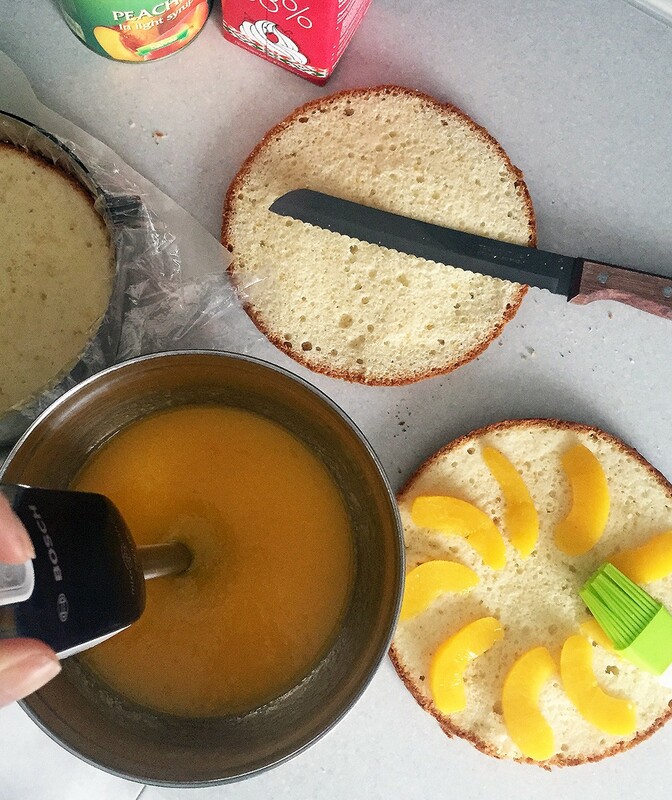 Leave a little syrup from the fruit or berries for impregnation of cakes. Sift flour with baking powder and mix. Eggs with sugar whipped into a thick foam (this is important, whisk 2-3 minutes before the increase in the volume doubled). By the egg mixture add the melted butter, milk, mix whisk or spatula. Once added to a mixture of portions of the sifted flour, mix gently with a mixer at low speed. Long did not have to whip to the dough "opal". Форму застелить пергаментом и перелить тесто. Выпекать в разогретой до XNUMX градусов духовке XNUMX-XNUMX минут. Готовность проверяйте шпажкой. Korzh remove from oven, allow to cool slightly in the form of first, after (removing from the mold) - on the grid, turning it upside down. Once cooled cut into 2 part. Gelatin powder soaked in syrup / juice or water until the swelling on 30-40 minutes. Whip cream (they need to be well chilled), adding portions of sugar to stable peaks. Yes, we have a large amount of whip longer than usual (6-8 minutes). Whipped cream on the time you can put into the refrigerator. The water and sugar to combine in a saucepan and bring to a boil, reduce the heat and cook until the "thin thread" minute 3-5, to get the syrup. Beat yolks. In the middle of the process to add them hot (just from the heat!) Sugar syrup portions. Whisk a couple of minutes to splendor. Gelatin (must swell, absorbing all the liquid) heat up in the microwave 30 seconds (or at the plate, but be sure to watch out that it does not boil, otherwise it loses its properties). Connect the gelatin and egg yolks, cool. Gently introduce yolk "cream" of whipped cream, stir whisk or spatula until uniform. To mousse does not freeze ahead of time, do not store it in the refrigerator and stir occasionally! Soak gelatin in syrup, taking on the number 100-150 ml. Leave on 30-40 minutes to swell. Fruits pyurirovat blender until smooth with the remaining syrup. The swollen gelatin warm up (do not boil!) Until complete dissolution, and connected to receive the fruit puree. While the cake will be in the assembly process, stirring occasionally jam, in order not stiffened. Just note: you can use the jam-jelly to decorate the cake on top of it (as in the photo). The second option (also the so often do) - to make the layer directly confiture between shortcakes **. I practice both. So, for building (as pictured) mousse cake, take the form of a split bОng bigger size than cakes. For example, if shortcakes 20 cm, the shape should ideally be - 24 cm. Cover the bottom of the form of parchment and place in the middle of the cake so that the edges to form on all sides remains the same distance (empty space). Top mousse pour until it completely fills and closes voids cake (should leave approximately half mousse, but no more). Put in the fridge form 30 minutes to pour a mousse. 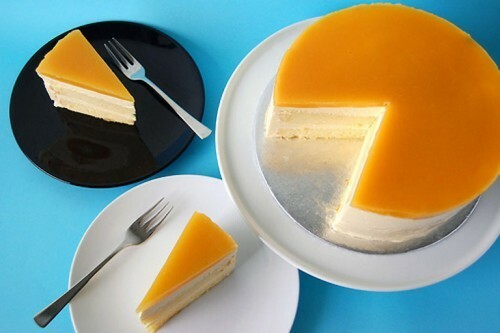 Once on top, place the second cake (like the first, exactly in the middle, so that all sides to the edges remained the same distance), soak again syrup. Pour the remaining mousse (cake must be completely closed mousse). Again, store in a refrigerator until solidification. Once mousse "grab" top fill and clean fruit jam in the refrigerator for several hours until complete solidification. **Yes, if you make a layer of jam between shortcakes (put the cake - filled - we waited pour - put the second cake on top), then a split form that can be used directly of the same size as the cakes. So it will be more convenient. All mousse in this case is poured on top of the two cakes. And already for this advise to use bОgreater in size shape shifting "blank" 2 cake with jam in the same way: the middle mold, leaving all sides with the same distance to form edges. After you should wait for a full pour mousse. On top of the cake in this case can be decorated with slices of fruit, berries, mint leaves. To get the cake out of the mold, enough to hold wet sharp knife along the rim. After - carefully and reveal the shape without sudden movements. Note cake before it should have a good "get to grips" (in the refrigerator for at least 5 hours! ).